Over the hills and far away, Teletubbies come to play! That's right, the multi-colored pack of fuzzy little aliens are heading down from their grassy knoll for some much-needed playtime and Tinky Winky is leading the pack. Who knows what adventures the friendly purple creature is bound for today! Maybe he will visit with the baby faced sun and they'll engage in a lovely sing-along together or maybe he will turn on his tubby screen and see what's going on in the world? Tinky Winky loves checking in with random kids from different parts of the world! Later, he'll probably open his magical expanding handbag because there's always something exciting in there. 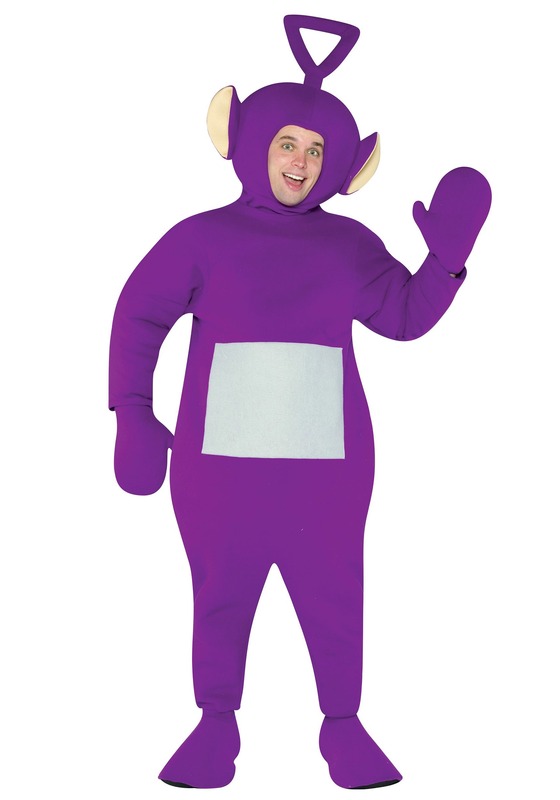 If you're getting bored of living your human life and you're curious to see what it's like becoming a rotund little Teletubby and you're also dying to find out what tubby custard tastes like then this costume is perfect for you. You'll be comfy and cozy once you put on this cushy jumpsuit. The headpiece features a triangle shaped antenna and a pair of ears. Soft mitts and shoe covers cover your hands and feet, respectively. Meet up with Dipsy, Laa-Laa, and Po for some much needed playtime. You guys could all chase around Noo-Noo, the robot housekeeper or make some yummy tubby toast to munch on! Okay, the magic windmill is about to stop spinning and the trumpet is blown its final toot so you know what that means? It's time for a Tubby bye-bye! Hop behind your hill so you can rest up because you have another fun day in store for you tomorrow!